The Super Power EZ hot tub Lift is the perfect solution to provide accessibility to above ground pools and hot tubs at an affordable price. This lift has many of the same great features as our very popular Power EZ Lift but capable of clearing walls up to 4 ft (1.2 m) inches high. 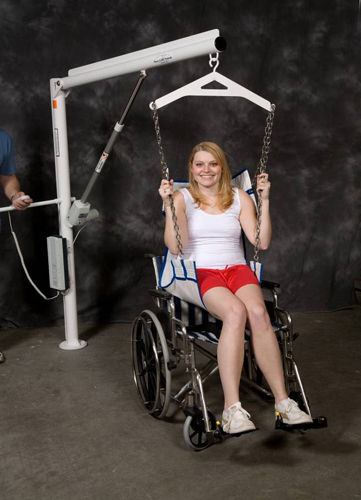 The Super Power EZ hot tub Lift comes standard with mesh sling seat and adjustable chains to allow users the benefit of a safe and comfortable fit. Options include a moulded hard seat if preferred. he Super Power EZ hot tub lift is battery-assisted to give a smooth lift and lower function, but will require a helper to rotate the lift across the pool wall. The lift is installed into a single poolside socket. Stainless steel construction and durable powder coat finish ensure long life and corrosion resistance. The Super Power EZ Pool Lift was built for years of trouble free use, making it perfect for your above ground backyard pool or spa.